Where does the mind go when it’s put into an induced coma for three weeks? Come down the rabbit hole with Portland actor Tony Reilly as he performs his one man show, The Coma Monologues, on Wednesday, June 17 and Thursday, June 18 at 7:30pm at the St. Lawrence Arts Center. 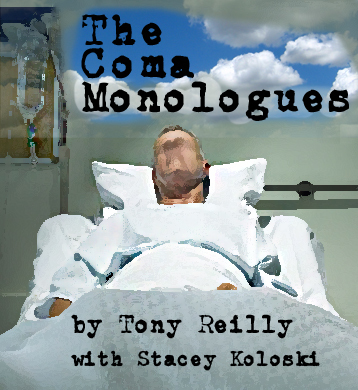 In The Coma Monologues, Tony Reilly relates the dreams he had while in a coma recovering from injuries he sustained in a December 23rd car accident that caused the loss of one of his legs and the death of his wife, Susan Camardo Reilly. Together Tony and Susan founded the American Irish Repertory Ensemble (AIRE), Maine’s Irish Theater Company, more than a decade ago. AIRE presents classic and contemporary Irish and Irish American productions that share the power and beauty of Irish theater and increase understanding of Irish culture. The Coma Monologues is presented by PortFringe Theater Festival. PortFringe is a non-juried fringe theater festival running June 20-28 at five stages in downtown Portland. Founded in 2012, PortFringe celebrates the vibrant performance art community in Maine and attracts artists from all over the country. Tony and Susan have been involved with PortFringe since the beginning, performing Conor McPherson’s play Come On Over in the inaugural festival. The Coma Monologues is being presented as a special event in advance of the 2015 PortFringe Festival. Please note that The Coma Monologues requires an event-specific ticket. Regular PortFringe show passes will not be honored. 100% of proceeds from tickets sold will go directly to the artist. RUN TIME: Approximately 1 hour. No intermission. Both shows are now SOLD OUT. If you would like to be added to a wait-list, please email portfringe@gmail.com.